At Cytocheck Laboratory, we offer, both computer-assisted and non-computer assisted ThinPrep Pap smear screening, as well as conventional Pap smear screening. The ThinPrep Pap screening offers an increase in ASC-US, LSIL, and HSIL detection over the conventional screen, along with a decrease in false-negative and unsatisfactory cases. The ThinPrep Pap is the only liquid-based pap test with FDA approval to test HPV, Gonorrhea, and Chlamydia straight from the vial, eliminating the need for co-collecting. 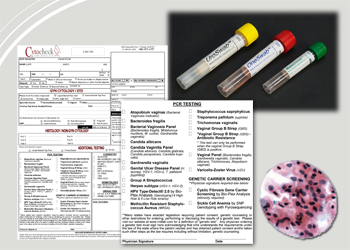 Cytocheck also offers non-gyn cytology, including brushings, washings, fine needle aspirations, urine specimens, and breast smears. 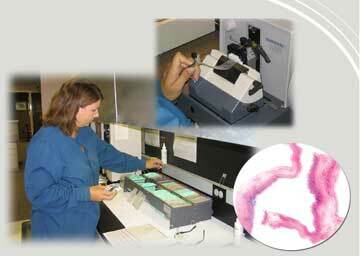 All cytology cases are completed and resulted in 1-2 working days from receipt in the laboratory. 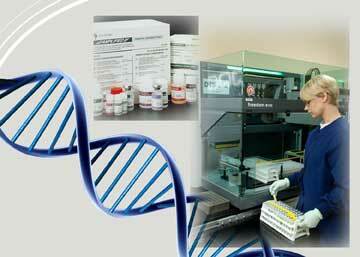 Pathology over-reads are performed at no extra charge, along with a 15% quality control rescreening process. At Cytocheck Laboratory, we take advantage of the most advanced technology available for STD testing. High-risk HPV testing is performed using the Cervista platform, which uses signal amplification and fluorescence detection to detect all 14 oncogenic strains of HPV. HPV results are available 1-2 working days from specimen receipt in the laboratory. For additional information, see the Cervista web site. Gonorrhea and Chlamydia testing can be ran using the APTIMA COMBO2 ASSAY or the PACE method, both of which are offered through Gen-Probe. Because we specialize in women's health care, the majority of our surgical pathology specimens annually are GYN. Correlating Pap smears are available on biopsy reports. We have access to a wide array of immunohistochemical stains and specialized cancer testing such as FISH, ISH, IHC, HER2, and Flow Cytometry. Non-GYN surgical pathology is offered through fine needle aspirations, brushings, washings, urine specimens, and breast smears. Specimens are examined, interpreted, and reported out within 24 hours of receipt in the laboratory. 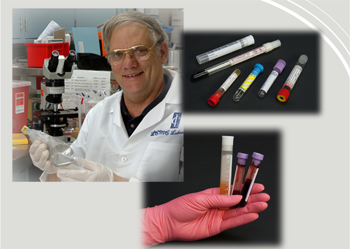 Medical Diagnostic Laboratory web site. Cytocheck Laboratory has partnered with Labette Health hospital laboratory to provide clinical laboratory testing to our clients. 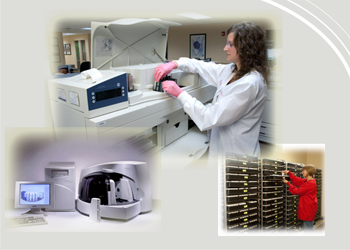 Labette Health Laboratory is a state-of-the-art facility, providing 24/7 coverage by registered medical technologists. Dr. Welch, owner and pathologist of Cytocheck Laboratory, is also the Medical Director for Labette Health Laboratory, providing an open and immediate line of communication between the two laboratories. Cytocheck has an electronic interface with Labette Health to download results in near real-time results. Cytocheck representatives remain the contacts for all questions and queries regarding clinical testing, helping to make Cytocheck Laboratory the only laboratory necessary for all of your health care needs. Labette Health is fully accredited and certified by the College of American Pathologists and the American Association of Blood Banks. 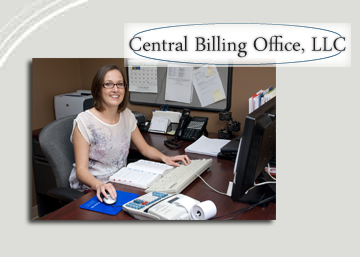 Central Billing Office, LLC, has been providing billing services to physicians since 2000. We pride ourselves on being a progressive billing service able to stay current with the ever-changing regulations in the healthcare industry while still maximizing reimbursement in a timely manner. By allowing Central Billing Office to handle all of your billing needs, your office staff will have more time to devote to quality patient care and other important day to day tasks. For more information on how Central Billing Office can assist with your billing needs, contact your Cytocheck Laboratory representative or call us at (888) 403-8770.